A silver two-handled cup on a shallow foot, with two scroll handles, the body flat chased with chinoiserie scenes, showing one figure holding a parasol over another, exotic birds and plants. The reverse is engraved in Latin: Ex Regio Fulcro Regis Salus. The base carries an inscription that the silver used to create this cup was taken from the staves used to support the silk canopy carried over James II at his Coronation.The chinoiserie figures which form the decoration may relate to the use of Chinese silk used to create the cloth of gold canopy, although equally at this date chinoiserie motifs were extremely popular as decorative features on silver vessels. Many of the motifs used were drawn from Dutch prints, and especially the works of Johan Nieuhof, of the Dutch East India Company, whose account of his travels to China was translated into English in 1669 and published again in 1673. Further illustrations by his compatriot Athanius Kircher were also popular in England and seem to have been influential in the style of plants engraved on silver of the period. The maker TS also produced a pair of salvers with similar plants and birds with their distinctive crests chased into the decoration, marked for the year 1683/4. One of these was formerly in the Jaime Ortiz-Patino collection; the other is in the collections at Polesden Lacey (NT 1246855). The canopy carried over the monarch during the coronation procession was traditionally borne by the Barons of the Cinque Ports.The title was not a permanent one but was awarded for the day of the coronation. These figures were prominent gentlemen of the five ports and two 'ancient towns' which had historically formed the first line of defence in England, all situated on the southern coast in Kent and Sussex: Hastings, New Romney, Hythe, Dover, Sandwich, Rye and Winchelsea.The Latin inscription on the cup refers to this ancient defensive role - it translates loosely as 'from the region which defends the King'. At the coronation of James II and his consort, Mary of Modena, which took place on 23 April 1685, four barons carried each of the staves supporting the canopies. The King and his consort processed separately; thus thirty-two barons were involved in the ceremony. The procession led from the Tower of London to Westminster Abbey through the City of London. In payment for their role, the barons were offered the silver from the staves and bells dressing the canopy, as well as a share of the cloth of gold from the canopies themselves. They were also invited to the coronation feast, held in Westminster Hall, where they sat at a table to the right of the monarch. The barons each received around 16 troy ounces of silver as their perquisite. 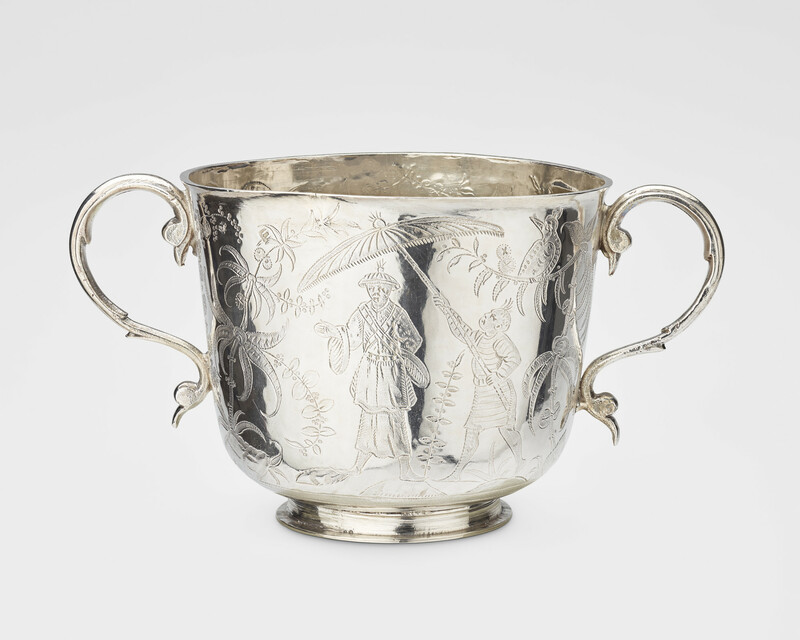 It is not yet known which of the barons used the silver from his share to be made into this cup. A similar vessel, with a lid, is in the collections of the V&A Museum (M.34:1, 2-2008), although that version has more elaborate handles and the cup has been gilded. It was made for two of the barons, Cresheld and Gawden Draper, from Winchelsea. Like this example it is flat chased with chinoiserie decoration. It is likely that this cup also had a lid when it was first made. It now weighs a little over 13 1/2 troy ounces - the remainder of the usual 16 ounces presumably made up by the now-missing lid.